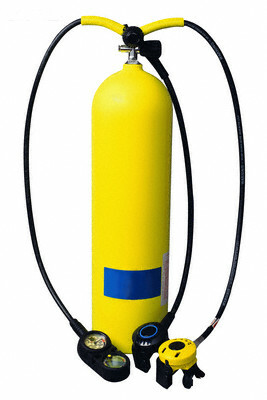 A diving cylinder, scuba tank or diving tank is used to store and transport high pressure breathing gas as a component of SCUBA (Self-Contained Underwater Breathing Apparatus). It provides gas to the SCUBA diver through the demand valve of a diving regulator. Diving cylinders typically have an internal volume of between 3 and 18 litres and a maximum pressure rating of 200 bar to 300 bar, (about 3000 psi to 4500 psi). The internal cylinder volume is also expressed as "water capacity" - the volume of water which could be contained by the cylinder. When pressurised, a cylinder carries a volume of gas greater than its water capacity because gas is compressible. 696 (3 x 232) litres (25ft�) of gas at atmospheric pressure can be compressed into a 3-litre cylinder filled to 232 bar. Cylinders also come in smaller sizes, such as 0.2, 1.5 and 2 litres, however these are not generally used for breathing, instead being used for purposes such as Surface Marker Buoy, drysuit and buoyancy compensator inflation.